Serial amphibian creator Alan Gibbs has used the American International Motorcycle expo in Florida to launch three new outrageous recreational vehicles. 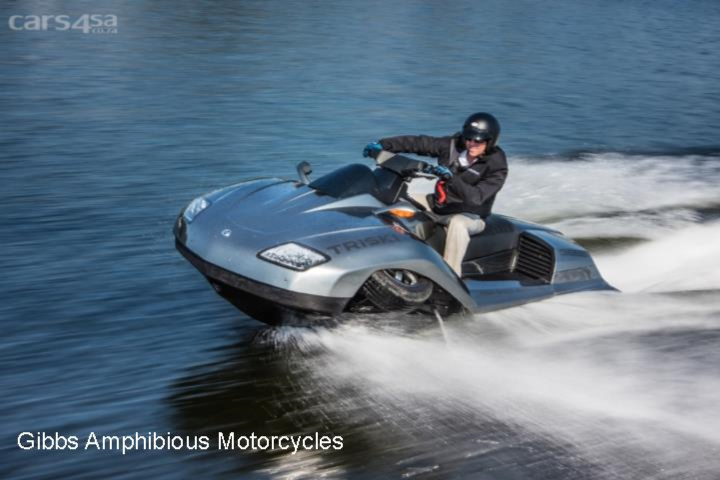 Not satisfied making ridiculously fun-looking amphibious quadbikes, cars and trucks, Gibbs has now built two-and three-wheeled motorcycles that you can ride straight down a boat ramp into the water. At the touch of a button they convert to jet skis, retracting wheels out of the way and switching to jet propulsion. There`s almost no delay-the switch from road mode to water mode is done in less than 5 seconds, so you barely even lose momentum as you ride in or out of the water. We`ve written many times about Kiwi entrepreneur Alan Gibbs and his remarkable amphibious recreational vehicles-the 100 mph Aquada sportscar, the Quadski ATV and the Phibian `amphitruck` stand out. The Gibbs Company has distinguished itself by building truly high speed amphibians that can reach `yee-ha` speeds both on land and water, as opposed to cheaper and more practically minded convertibles like the Sealegs machines. Gibbs amphibians are engineered for excitement. Gibbs originally wanted to build proper James Bond-style amphibious cars like the Aquada, but found there was a ton of regulatory issues involved trying to meet safety standards for a passenger car. Recreational vehicles like ATVs aren`t subject to the same scrutiny, and offered a quicker path to market. Of course, motorcycles and trikes have much less stringent safety requirements as well, so Gibbs has just unveiled three new concepts-one ATV and two street-legal amphibians that fall into the motorcycle category. There`s the Terraquad side-by-side ATV and Triski three wheeler, which use large engines to deliver 135-plus horsepower giggles on land and water. And there`s the fascinating Biski-a 55-horsepower scooter that`ll easily beat highway speeds on land and go nearly 105 kmh on water as well.